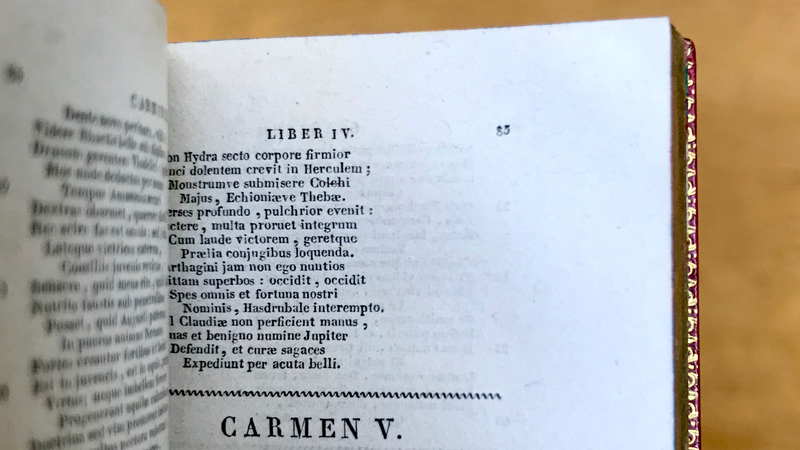 Special Collections and University Archives has recently acquired an exceptional miniature book: a copy of the 1828 edition of the complete works of Horace printed in a microscopic 2.5pt font designed by the Didot firm. The French Didot family included several generations of printers, engravers, and master typographers active in the eighteenth and nineteenth centuries. They contributed many major bibliographic innovations including devising a “point” system for measuring type (the didot, by François-Ambroise Didot) and innovating technology within the fields of papermaking, engraving, and founding. The firm also produced many luxurious and beautifully-designed books. Firmin Didot (1764-1836) was the designer of the punches for the elegant Modern Didot typefaces, notable for their extreme contrast in weight and hairline serifs. These designs are well known today through contemporary revivals like Adrian Frutiger’s typeface designed for Linotype (1991) based on Firmin’s original designs. Third generation Henri Didot (ca. 1765-1852) continued the family’s legacy of typographic innovation. At the age of 66, Henri developed a new casting method to create a type so small he named it “microscopic” (Piton, p. 4). He named his new mould polyamatype (1819), which won him a gold medal prize upon its display in L’exposition des l’industrie francaise of 1819 (Colmott, p. 53). Henri’s incredibly small font was 2.5pts and was used to print two books: La Rochefoucauld’s Maximes (1827) and Horace’s Opera omnia (1828). In Percy Spielmann’s catalogue of miniature books (1961) he deems the type “one of the typographical wonders and an unsurpassed feat as far as minuteness and beauty of type is concerned.” Another miniature font used in the nineteenth century, the Diamond Roman font used by William Pickering, is comparatively larger, measuring 4.5pt. The University of Oregon Libraries’ copy is number 40 out of 100 and measures a mere 3 x 1 ¾”. It is bound in a fine red goatskin morocco by the C. Hardy atelier of Paris (est. circa 1850). The binding is intricately gilded, decorating the covers, spine compartments, titling, turn-ins, and page edges. This miniature book is an exemplar of fine nineteenth century book design as well as a landmark typographic experiment in miniaturization. 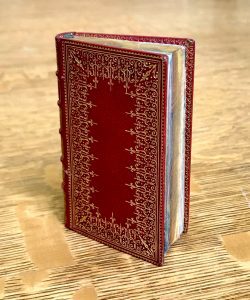 This volume joins Special Collection and University Archives’ collections of fine printing and bindings, which include additional works by the Didot firm, and UO’s collection of miniature books. Colmont, Achille de. (1855). Histoire des Expositions des produits de l’Industrie Française. Piton, Eugène. (1856). Famille Firmin-Didot: Imprimeurs, libraires, fondeurs, graveurs, papetiers, inventeurs et littérateurs. Spielmann, P. (1961). Catalogue of the library of miniature books. London: E. Arnold.